This impressive enrollment is the result of New York Mayor Bill de Blasio’s efforts to vastly expand pre-K in his city. “The start of public school on Thursday in New York City should be the usual merry scramble of chattering children and stressed (or relieved) parents. There will also be something new: a fresh crop of 4-year-olds, more than 50,000, embarking on the first day of free, full-day, citywide, city-run prekindergarten. Now, New York is working to ensure that as its pre-K programs grow, their quality remains high. 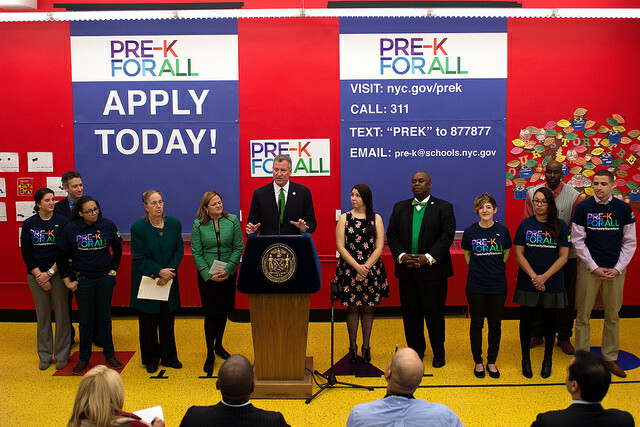 Earlier this month, Capital New York reported, “The administration rejected 45 percent of the pre-K programs that applied to offer instruction this fall, a large percentage considering the well-documented space crunch for pre-K seats. “‘The goal is not just to open up seats but to open up high-quality seats,’” Buery said. “Still, de Blasio acknowledged the city has not yet secured all of its pre-K space for the fall. New York’s efforts have also won national attention and praise. Capital New York reports that Hillary Clinton is among New York pre-K’s supporters. Clinton was speaking at “a panel discussion in Washington hosted by the Center for American Progress and the American Federation of State, County and Municipal Employees,” when she raised New York’s work. “The United States needs to invest more in ‘the human infrastructure,’ too, she said, and that’s where she brought up de Blasio. “We did last year’s improvement – or expansion – in record time. We basically had about five months from the time the funding was approved to go from 20,000 full-day seats to 53,000. This time – thank God – we have a lot more time and expertise, but it’s still a big jump that we have to achieve. We need the state to help us, and when I gave my budget testimony in Albany, I agreed with the recommendation of the regents – the state regents who said this program should be funded with $370 million dollars of state resources. I agree with that and we are pushing for that in Albany so can keep this progress going.